Hairy Larry and The Flying Hungarians will be appearing at the April Blue Monday. The Flying Hungarians are a Jonesboro Blues Band and band leader Hairy Larry also produces a weekly Blues show on KASU 91.9 FM called "Something Blue". Blue Mondays are held on the first monday of each month and there is no cover charge. 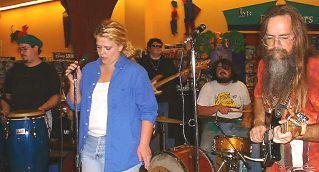 Blue Monday is held at Potlickers Uptown Deli located at 311-B Main Street in Jonesboro, Arkansas.